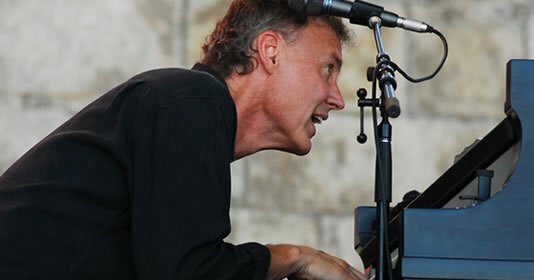 This week Bruce Hornsby and his longtime band, The Noisemakers, have released their first live album in over a decade, Bride of the Noisemakers, a double-disc set overflowing with diverse musical influences and in-the-moment inspiration. The performances on Bride of the Noisemakers come from the years 2007-2009. What were you looking for in selecting its tracks? The technical best? The energy? Not technical at all although I want the playing to be strong. I don’t want there to be much sucking going on. [Laughs] I’m looking for definitive versions. And what would define a definitive version for me is a spirited and creative version where I’m singing it really well; where the groove is great. It’s got to have that spirit—the joyful-noise quality about it—because I think that’s really important. Hopefully that comes across on this record, how much we enjoy playing and how much spirit is in the music. It’s not so much about that. It’s not about leeway or turning somebody loose. Although our approach is improvisatory we’re not much for the long, two-chord jam. You don’t hear on this record or you don’t hear live somebody just being turned loose, quote unquote, as you say. “Hey man, just blow.” That to me is kind of dull. And it’s not that creative to me to do that. What I think is spontaneous about what we do is, for instance, the bass player, J.V. [Collier], will play some lick. I’ll hear the lick and I’ll play the lick back at him. And then we’ll make that into a new section, kind of a riff. Then everyone jumps on that. Then that lick will be played. And I may come up with some chords that go under that and then somebody will hear the chords, and they’ll go with the chords and you move… It’s more about creating new sections. It’s a very conversational approach. No. When you come to our shows you’ll see that the band pretty much does not take their eyes off of me for long, because I’m always looking to move it around. Frankly, what I’m looking to do is entertain the band. We’re all grizzled vets of many gigs from our beginning days probably playing wedding receptions, bar mitzvahs, disco bands, rock bands, frat parties, soul bands. Having to play the songs straight is a real prison for me. So when something sparks off a riff and then you move into different territory, everybody’s got to be locked in. They’ve got to be ready to turn on a dime; ready to move with the groove or just ready to move with whatever the new germ of an idea is. Sometimes I’ll go into another song. And the guys will look at me, like, “Oh no, I don’t know this song.” So I’ll be singing, and I’ll play the piano with one hand and with my other hand I’ll be holding up numbers for chords. That happens a lot, too. To me it’s just what’s fun about music; it’s trying to keep it always fresh. And, hey, we don’t mind screwing up at all. I’m not trying to play the perfect gig at all. I’m hoping to do it very well, to play it really well and sing it well, but I’m not looking for it to be perfect. Hell, I’m forgetting words. [Laughs] There’s lots of screwing up going on! Well, for me it is. For most bands it’s really not the point at all. Most bands that you would hear they’re playing it very much by the book. And a great gig for them is when they play it with no mistakes. They’re doing the same set every night. They want to play the songs exactly right—no mistakes; no clams, as we call it—but I don’t care about that. That couldn’t be less interesting for me as an approach. Does your approach to the live show—that spontaneity, that spirit—affect your songwriting? Not really; not so much. The songwriting is a very different thing. I’m just looking to be inspired by a lyrical idea or a musical idea that either moves me to the point of giving me chills or it's just something new; some new harmonic area or some increasingly dissonant chord structure or melodic structure that I’ll utilize in my music increasingly through the years. You’ve never been complacent to play just one type of music. To what do you attribute your musical curiosity? Musically I am intellectually curious. And I play an instrument that is quite possibly the only instrument that exists that you can be the whole orchestra; the whole orchestra is at your fingertips. You could spend two lifetimes and not deal with the literature of the piano. If you talk about the incredible, massive classical tradition and then you go into popular song styles from ragtime to boogie-woogie and blues and then to all the jazz… Just dealing with jazz from Jelly Roll Morton, which comes from ragtime; and then goes into Fats Waller and then Art Tatum with the stride music and James P. Johnson; and then to be-bop with Bud Powell and then into hard-bop/post-bop in the ‘60s with Chick Corea and Keith Jarrett and McCoy Tyner and Herbie Hancock, and on and on. Then deal with New Orleans piano—Professor Longhair, Huey “Piano” Smith, Dr. John… You could just go on and on. I love all this music and on a virtuosic level I’m interested in playing the instrument well, and I’m interested in all these styles. I’m interested also in finding a place for this pianistic expression in my songwriting.